The historic Noel Baxter Dowling house, built in 1901, is now the home of Mildred's Restaurant and Tea Room. After Mr. Dowling died, his widow, Lizzie Wells Dowling preferred to live at the family's house in Pinckard, Alabama. N.B. Dowling's daughter Cora and her husband R.H. Ramsey moved into the house and reared their children. Their oldest daughter, Cassie Ramsey, lived in the house until the 1960's and remained ownership until a couple of years before her death, when she sold it to her nephew, Richard H. Ramsy,III. Richard renovated the house in 1988 and converted it for us as his law office. 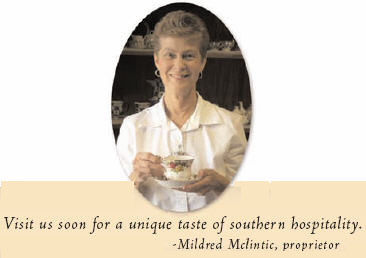 Mildred purchased the house in June of 1996 and converted it for use as a restaurant and tea room. At first, the restaurant was only opened for private parties. In 1998 it was opened at noon Tuesday, Wednesday and Thursday to the public. Mildred’s is open for lunch Wednesday and Sunday and for private parties and special events.